Papaya Leaf Juice for Dengue – It Works! 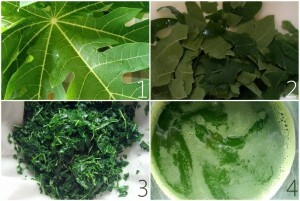 More than a year has passed since I made the blog post on the use of papaya leaf juice for curing dengue. During this period, I have myself needed to use papaya leaf juice for what was probably dengue. I did not undergo the blood test for dengue but all the symptoms pointed to it. My Complete Blood Count showed a drop in platelets, a drop in the White Blood Cell count and a raised Haemoglobin count; all of which pointed to probable dengue. 5 days of papaya leaf juice followed. I took it twice a day for 3 days and then once a day for 2 more days. The fever was gone by day 1 of the Papaya Leaf juice therapy, probably because I was already taking homeopathy for it. We (my husband was a BIG help at this time – I felt incredibly weak) used 2 leaves at a time, getting fresh leaves everyday. After washing the dust off the leaves, we would break off small bits of the leaves, removing the bigger veins. Once this was done, we found it best to put them into a grinder, running it for just 2-3 seconds, just so that they were finely chopped. Then we put them into a damp muslin cloth; (adding a sprinkling of water to them, so that it got easier to squeeze. When we tried it completely dry, we were unable to get any juice out.) Then holding it over a bowl, we would squeeze it as best as we could to get the juice out. About 2 desert spoons of juice is enough. It’s bitter like hell, but worth it! At the end of 5 days, I almost missed it! Some say that the leaves have to be from a ‘female’ tree or a fruit-bearing tree. I don’t know what tree was used for the leaves I got. Some said the leaves have to be young and tender; I used whatever was available – a few times I got young tender small leaves, some times I got big dark green leaves. I think all of them work. Many of the studies I read mentioned no specific type of tree or leaves. Over this year, I have recommended this method to several patients suffering from Dengue – this has worked every time. So it’s best to find and keep in mind where your nearest papaya tree grows! Just in case!! Posted by Dr. Firuzi Mehta on Thursday, 5th December 2013 at 11:34 am under News. Why Would Homeopaths Want to Practice Allopathy? Copyright Dr. Firuzi Mehta. All Rights Reserved.